My name is Emma and I was an intern with the N.C. Wildlife Resources Commission this summer. Throughout my internship, I had the opportunity to work with several different biologists, ranging from those who worked with freshwater mussels to black bears. Here are some updates of what Commission biologists were doing this summer in the field. Endemic to North Carolina and listed as federally-endangered, Tar River spiny mussels are one of the only freshwater mussels with spines in the world. Due to its status, the Tar River has been stocked with spiny mussels in hopes of growing the population. In June, Commission biologists (along with USFWS, NCDOT, N.C. State and others) performed by augmentation surveys in Little Fishing and Fishing Creek, which are tributaries of the Tar River, to see the species’ progress. The survey had two different components. The first included snorkelers surveying a quadrat for 90 seconds. After each quadrat, snorkelers would report if a “spiny” was found. The process continued until the entire reach was surveyed. A more targeted search was done using a passive integrated transponder tag (PIT) reader. The PIT tag reader uses electromagnetic fields to find spiny mussels that have been tagged. Each tag has an identifiable unique alpha-numeric code that gives biologists important information about the mussel. 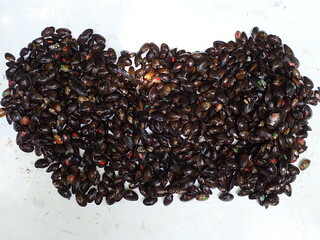 Measurements of each mussel were taken, and females were checked for fertilized eggs. Bear biologists have been hard at work releasing rehabilitated black bears from a pen in Caswell County to their homes in either the mountain or coastal regions. Before release, biologists must process the bears. This includes recording the bear's size, weight and any injuries or health issues. 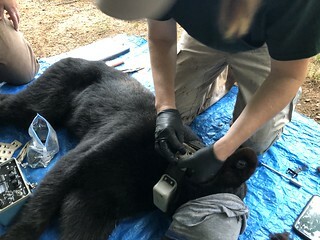 Each bear is also tagged and given a radio transmitter collar and a unique lip tattoo so that it can be recognized by biologists. Biologists are often forced to quickly adapt to any situation that is presented to them during field studies. This project was no exception as two black bears were found in the same trap one day and the biologists had to process two bears at the same time. The project was still executed perfectly and the bears were returned safely to their homes. 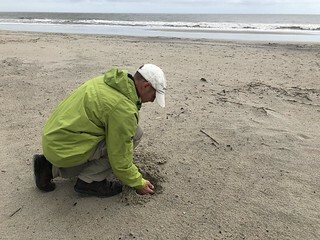 Last week, Commission sea turtle biologist Dr. Matthew Godfrey and his team inspected the beach on Oak Island where a sand nourishment project is wrapping up. The project, conducted by the U.S. Army Corps of Engineers, focused on widening the beach using dredging. Taking sand from the same depth as a sea turtle nest, Dr. Godfrey checked for compactness and coloration. The sand should not be too compact or the eggs could risk suffocation and overheating. The sand should also be a natural and consistent color. It was their hope that the sand would meet the requirements so that the beach would not need to be tilled, which would put additional stress on the animals that live on the beach. The sand passed the sea turtle “nest test” and the team agreed that no tilling would be needed. Not only does the beach meet sea turtle nesting standards, but beach inhabitants will not be disturbed any more than they have been already. Congrats to Oak Island, and thank you to everyone who made this project a success! We are on the 11th year of the Box Turtle Connection project and big strides are being made. The project is statewide and focuses on the long-term conservation of Eastern Box Turtles, N.C.'s state reptile. Box Turtle Connection gathers data two different ways. The first is through telemetry tracking. Transmitters are put on turtles so that they can be tracked using radio frequency. The second is the mark-recapture method. Plots are surveyed in the various study sites across the state. When a turtle is found for the first time, it is marked using a special three letter code. Then, if the turtle is found again, researchers can compare the location to the previous location it was found. Both methods are crucial in data collection for the development of conservation strategies. 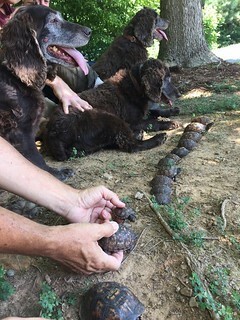 Recently, the Lake Raleigh Woods study site invited a man and his turtle-trained Boykin spaniels to search for turtles. The dogs went out several days with the team, using their keen smell and gentle mouths to find and retrieve Eastern Box Turtles. Overall, the dogs found 30 turtles of all ages. The Lake Raleigh Woods study site is in the midst of changing the transmitters of the telemetry turtles for another year of tracking. Not only are the transmitters on turtles from previous years being replaced, but a transmitter was put on a new female turtle in an area of the woods that hasn't been studied before. The Box Turtle Connection team is excited to learn more about female behavior in this part of the woods and to obtain more data on the other turtles. This internship has been an incredible experience for me, one that I am sure to look back on fondly. Thanks go out to everyone at the N.C. Wildlife Resources Commission for this invaluable opportunity.